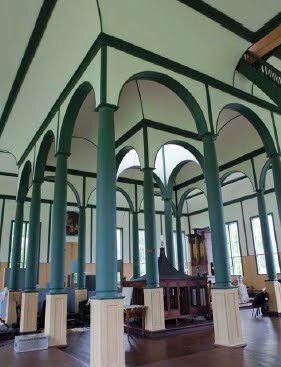 Recording an album in an 1832 temple in the middle of a sizzling hot Canadian sum- mer was no easy feat. But then recording engineer Jeff Wolpert thrives on challenges. Mastering engineer B ob Ludwig does too, but his challenges have a different focus. His job was to put the final finishing touches on the album to make it as perfect a listening experience as it could possibly be – including a vinyl version. The album, which will be re- leased as a CD, digital download and for the first time in 16 years on 180-gram vinyl in a numbered, limited edition of 5,000, features such rich classics as “The Star of the County Down,” “As I Roved Out” and “Down by the Sally Gardens,” plus one of Loreena’s original compositions. The three-tiered, symmetrical temple was built by a small religious group whose fou nding values were peace, equality and social justice. Loreena felt the temple’s historical and architectural significance, as well as its exquisite acoustics, would be suitably inspiring for recording the album. 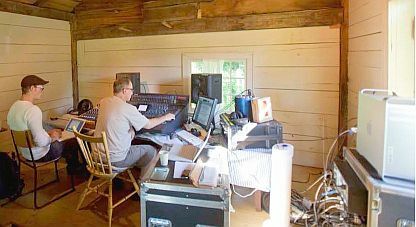 “The technical challenge was we had to turn an 1830s building made entirely out of wood into a recording studio,” says eff, “and it was right beside a major road, which wouldn’t have been a problem back in 1830 but it is now.” There were passing cars and motorcycles to contend with, not to mention plenty of birds since the temple is in a wooded park. Then there was the heat. The temple isn’t air-con- ditioned and Jeff’s equipment won’t function well if it’s hot, so he had to set up a small room outside, known as a ‘cookhouse,’ where he kept the record- ing equipment cool using fans. Setting up microphones was another conun- drum. Jeff wanted Loreena and the other musicians to be able to see each other, but didn’t want to hang microphones 12 feet above them all since everyone would be recorded at once which limits editing and mixing options later on. Instead, he opted to put a microphone up close to each musician then put soft barriers between them so their individual sounds could be slightly isolated. foot truck (six by six metres) and it took four men to unload it. Once the album was recorded and mixed, off it went to Bob Ludwig, founder of Gateway Master- ing Studios in Portland, Maine in the United States. The multi-award-winning mastering engineer has worked on albums for some of the biggest names in the music industry. In essence, mixing is pulling all the pieces together so they sound right. Mastering is adding that extra bit of polish at the end. And then there is vinyl. For the first time since 1994, Loreena’s latest re- cording is also available on vinyl. The Wind that Shakes the Barley is being offered as high-quality,180-gram vinyl in a numbered, limited edition run of 5,000, and these are anticipated to become col- lectors’ items. And while CDs and downloads have reduced resolutions, vinyl can reproduce some aspects of the music best of all because it’s mastered from the full- range, high-resolution digital master, not a digital- ly-reduced CD. “Vinyl gives you a wonderful warm sound and compared to a CD, even played on a good system, the sound of Lorenna’s vinyl is slightly wider because it comes from a better source,” ex- plains Bob, adding that vinyl is also able to capture an entire octave of high frequencies that CDs can’t. 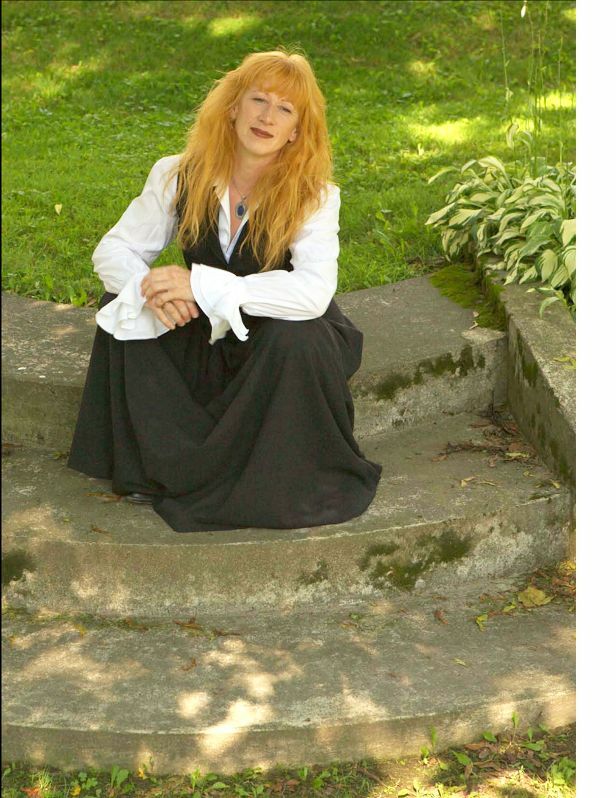 In response today to the tabling in Parliament of the new Copyright Bill C-32, singer and composer Loreena McKennitt commented publicly that she welcomed strengthened protection of intellectual property. While noting that she had not yet had the opportunity to closely study the details of the new Bill, the award winning recording artist and Member of the Order of Canada emphasized that it was imperative that the government finally bring Canadian law in line with international treaties signed many years ago. Loreena pointed out that creative people have the right to earn a living from their work and spoke of the damage that has occurred in the absence of sufficient regulatory protection. Loreena hopes that the many Canadians who participated in or read about the public consultations on copyright last summer will take the time to fully understand the new provisions and not be swayed by oversimplifications or alarmist pronouncements of those with vested interests in a pirate or parasitic culture. 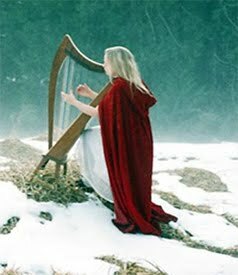 Oona McOuat : "Honey and Holy Water"
I recently had the chance to discover this talented harpist and musician on the net. Besides her enlightened spirit, musical qualities and style… what conquered me most was her storytelling, as Oona states… “we are gathering all over the planet – the healers and rememberers, the wounded and the weavers. In halls and hovels, in backyards and on beaches, men and women are gathering to remember the power within and the mystery without. Together, we are weaving the beauty into form“. 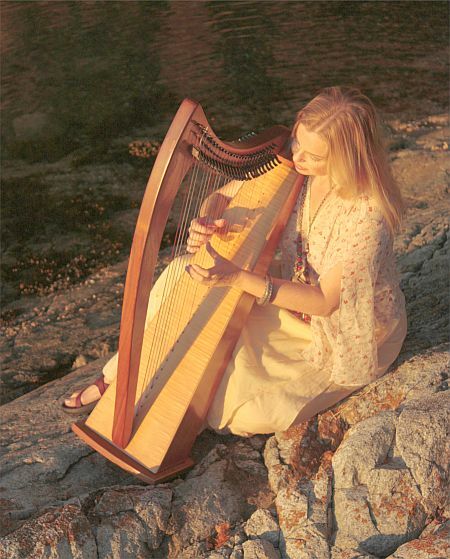 Rooted in the earthy and the ethereal, Oona moves beyond the gentleness traditionally associated with the harp to create music that is timeless yet contemporary. With her band Dream Deep she bridges the primal and the beautiful with startling grace. Evocative lyrics and world instruments merge to create a sound that is soulful, moving and transcendent. Songwriting re-emerged through a series of dreams. “Reconnecting with my muse was like awakening from a long winter’s sleep,” remembers Oona. And so began an intense period of creative development including studies in authentic movement, clowning and Butoh. She began to explore world music. In 1991, she was the featured female vocalist on Celso Machado’s Juno-nominated album TAIRA, singing in Portuguese and Yamomami. Then she followed the ancestral call and traveled to Scotland to discover her roots. From 1991 to 2005, she wintered on the Big Island of Hawaii, swimming and singing with wild dolphins and whales and exploring sound to new depths. She developed a music program based on singing and playing from the inside out, and became an inspired and dedicated teacher, expanding her work to include story, the mythic realms and environmental awareness and stewardship. Oona and her band Dream Deep perform at arts centers, festivals and concert halls; her warm and heartfelt presence transform an ordinary performance into an extraordinary event. 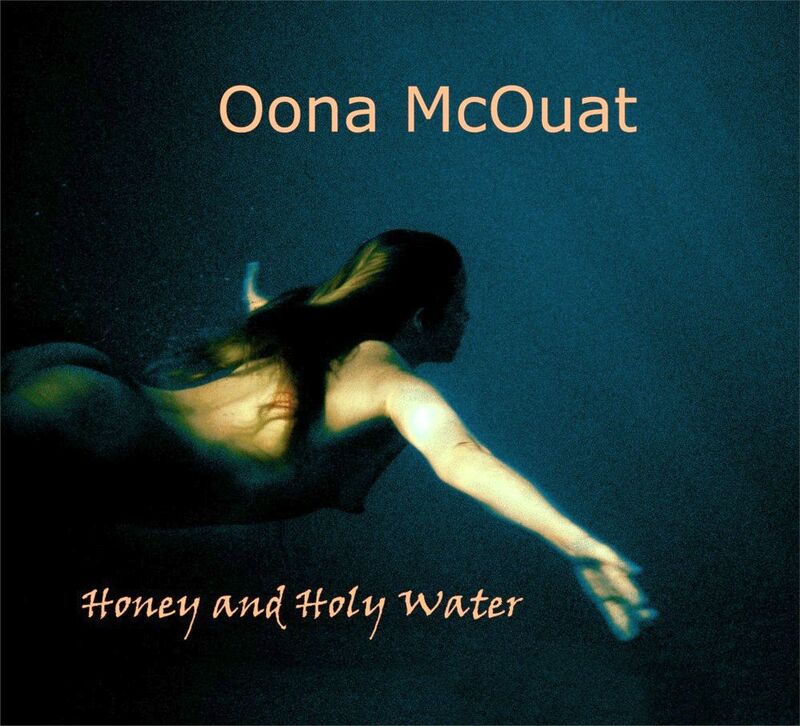 Sweet and soulful, Oona McOuat’s (pronounced oo-na mick-kew-it) new album Honey and Holy Water flows with urgency and wonder. Like the ocean is a stage for a dolphin’s song, Oona McOuat finds her voice and inspiration from the earth. The Saltspring Island singer-songwriter and harpist found many of the songs on her new album, Honey and Holy Water, hiding in Hawaiian waters or hanging from tropical fruit trees. The Vancouver-born vagabond has been living on Saltspring for the last three years, but called Hawaii home for more than a decade. She wrote the album’s first track, “Mystery,” after spending the day on the big island of Hawaii. Surrounded by huge cliffs lined with a black sand beach, she saw wild horses, just like in any good fairy tale. From the fun and funky re-creation of the trad tune “Drowsy Maggie” to “The Wild Ones'” heartfelt plea for preservation, through the broken-open love song, “Where the Emptiness is Full”, this album navigates mystery and loss with purity and grace while encouraging us to cherish what might yet be saved. This article was previously published on Mandolin Magazine by Danny Carnahan and posted under his kind permission. All rights reserved by the author. How many different ways can you come up with to play an Irish reel? And how different can you get before the reel becomes unrecognizable? These are two terribly important and closely-linked questions asked often in these days of blossoming Celtic musical expression and the conscious absorption of many world styles into the tradition. I figure the answer to the first question is: an unknown, very large number. The answer to the second depends on whether we’re talking about melody, harmony, rhythm, structure, or some combination of these things. In this issue I want to discuss (and strongly advocate) melodic variation in particular. Like most American Celtophiles, I first fell in love with Irish music through listening to records. Early on I discovered the modern Celtic revival supergroups like The Chieftains, the Boys of the Lough, and later Planxty and the Bothy Band. And I eagerly picked up vinyl collections of field recordings going back to the 1920s and featuring old masters like Michael Coleman and Padraic O’Keefe. Nearly every other budding American Celtic music nut did the same, if we weren’t lucky enough to hang out in the Irish bars of Chicago or Boston or New York. So, when we all learned tunes to add to our repertoire, we’d cop the licks off the records, doing our best to play the way the masters did. But the records failed in one respect to convey the tradition as it was and still is passed on in Ireland and Scotland. In order to fit onto first 78s and then short tracks on LPs, the tunes were rarely played through more than two or three times, before medleying into something else or just ending. This is one reason why the heirs of the Vinyl Tradition in sessions all over America tend to play tunes just twice through or maybe three times, and then immediately blast into the next tune. I don’t blame the speed of modern culture or the ever-decreasing attention span of America’s youth. I chalk it up to short 78 rpm sides and the fact that most American session players just play for each other and not for village dances, like they do in the Old Country. When I first started travelling extensively in Ireland I naturally found myself at village dances and ceilis and was delighted with what I learned. I found that simple tunes would roll along many times through while the dance went on and the better players made a point of slightly changing the tune, or at the very least, the ornamentation, a little bit every time it went by. I remember sitting and listening to fiddler Frankie Gavin during one such evening in north Clare, playing a tune at least twenty times through and subtlely altering it each time without ever straying far from the essential shape of the tune. Now, the concept of a tune’s “shape” (which I first illustrated in the Summer 2001 issue) is at the heart of the question about when a tune becomes unrecognizable. You can sometimes stretch a tune pretty dramatically and retain enough of the shape of it so other players in the session, or dancers dancing to it, or listeners just humming along, still know it’s the same tune. One common trick which some players do consciously and some without thinking, is to stay firmly within the implied chord progression logic of the tune, perhaps also within any arpeggio structure the tune is built on, while keeping the very end of each phrase the same as the standard, unornamented setting. Since a huge majority of Irish tunes are built around strong arpeggios within equally strong chordal progressions, you’ll find plenty of latitude to scramble arpeggios, change directions, and yet somehow maintain contact with the tune this way. All the best players have personal ways they step outside the tune while still honoring it. Some are more understated than others. One of my favorite founts of variation is Gerry O’Connor, who expresses his love of bluegrass by throwing in occasionally counter-intuitive, unexpected, and chromatic flights of fancy in his Irish settings. But rather than tossing you into the deep end, let’s start by paddling around a little in the shallow end of the variation pool. Here’s a transcription of a lovely newish reel, “Cahir’s Kitchen,” written by piper/whistle player Paddy Keenan, who was a founding member of the Bothy Band in the 70s. 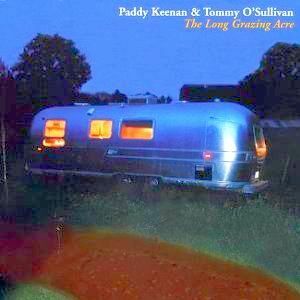 It’s from “The Long Green Acre,” a CD Paddy recently recorded with guitarist Tommy O’Sullivan and which is available in the U.S. on Compass Records. “Cahir’s Kitchen” is a pretty standard 8-bar reel pattern with an A part and a B part which actually share the identical chord pattern for accompaniment. But Paddy doesn’t bother to play it through with slavishly repeated A and B parts before beginning his variations. The variations start immediately, so the tune almost sounds like a four-part reel until you examine the pairs of 8-bar patterns and see that they’re really all variations of each other. I’ve transcribed the first two times through the tune for you, as Paddy plays it on the recording. I’ve tried to stay as close to his low whistle setting as I could though, naturally, a few of his slurs and slides are impossible to notate properly for the mando (and probably impossible to play, too). As you feel around for fingerings and ways to get up to the high bits in the B parts and back down alive, you’ll sense how this tune was clearly written on and for a traditional instrument very different from a mando. I love how Paddy feels so free to play arpeggios in seemingly any combination at the beginnings of phrases, while managing to get back to the same two-bar phrase each time. And this richness of invention is done without ever changing the underlying chords or rhythmic logic of the tune. I hope you’ll hunt down the CD to hear the tasty way Tommy O’Sullivan chords under the melody, but for starters, I’d recommend a light, swingy backbeat sort of feel, without snapping off the 2 and 4 beats too quickly. Rather use more of an ascending brush stroke to jazz it up a little. And adding suspensions to the chords can’t hurt one bit. After working with “Cahir’s Kitchen” for a while, try revisiting some other tunes in your Irish repertoire and looking for arpeggios you can scramble up or knock holes in, and see if this doesn’t encourage you to get more satisfaction out of each tune before moving on to the next one. A quote from Celtic Sprite : you may find this version of the tune on Paddy Keenan’s &Tommy O’Sullivan’s album “The Long Grazing Acre” w/ Paddy Keenan (pipes, whistle), Tommy O’Sullivan (guitar, vocals). For this tune: (F whistle). 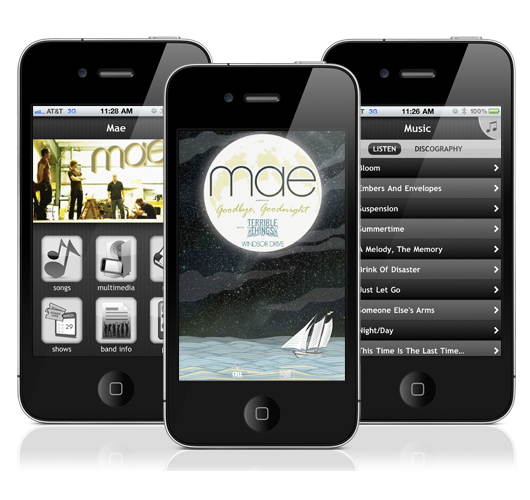 (Durham, NC – October 19th, 2010) ReverbNation, the leading Marketing and Promotion Platform for over 900,000 Musicians, Labels, Managers and Venues, has acquired Sound Around, a North Carolina mobile application development company focused on creating custom mobile applications for Bands and Musicians. The acquisition will enable ReverbNation to extend its comprehensive set of tools for Bands and Musicians to include the creation of mobile applications for its user base. Details of the transaction are not being released. ReverbNation is the leading online music marketing platform used by more than 900,000 Artists, Managers, Record Labels, and Venues to grow their reach, influence, and business across the internet. ReverbNation provides free and affordable solutions to individual Artists and the music industry professionals that support them in the areas of web promotion, fan relationship management, digital distribution, social media marketing, direct-to-fan e-commerce, fan behavior measurement, sentiment tracking, Web site hosting, and concert booking and promotion. ReverbNation’s innovation is in developing technologies that integrate the wide array of distribution, marketing, and promotional functions used by the music industry into one comprehensive and easy-to-use business application – helping virtually any artist grow their revenues, and providing insight into how each marketing input contributes to overall outcomes. For more information, please visit ReverbNation.com and follow ReverbNation on Twitter: www.twitter.com/reverbnation. “SongBook1” (KMCD279 – 2006), and “SongBook vol2” (KMCD287 – 2008). This is a great pleasure to share my music this way with you. 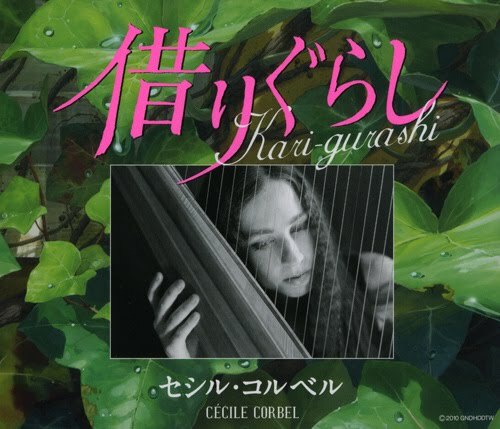 on the soundtrack of their new animation movie “Karigurashi no Arrietty”. The movie has been a very big summer hit in Japan with more than 7,5 millions viewers and the main theme song “Arrietty’s song” has become very popular there too. The OST will be available at the same time. by offering you this Cd collection before the release of my brand new CD in Spring 2011 . Interview previously published on the Manchester Wired, by Julian Fowler . All rights reserved by the author. 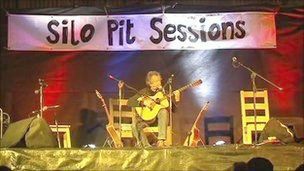 A barn on a County Fermanagh farm used for lambing and to store hay isn’t the first place you would expect a musician to launch their new album.But the venue made perfect sense to Irish singer and songwriter, Andy Irvine. His career has spanned five decades, and as a member of the folk band Planxty he achieved widespread success in the 1970s alongside Christy Moore, Dónal Lunny and Liam O’Flynn. Since then he has travelled the world, a troubadour of traditional music, playing the mandola, bouzouki and harmonica. His new solo album, Abocurragh, reflects his globetrotting experiences. “It was made mainly in Dublin but a lot of people were recorded in Hungary, in Norway, Australia. The album had been around the world before it came out,” he said. The album is named after a townland about eight miles from Enniskillen, although his home is actually in the adjoining townland, Ballysooragh. 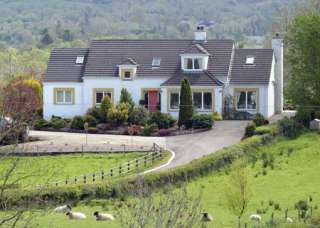 To launch his new album, he has returned to his home on County Fermanagh. He has shunned the glitzy hotels and city-based celebrities and chosen instead to perform in a hay shed. The idea for t he “Silo Pit Session” came from Andy’s landlady Janie Crone who owns the farm with her husband John. The family has been busy transforming the farmyard into Northern Ireland’s newest music venue. She said: “We would normally round bale but we’ve actually square baled so seating is bales of hay. What will the acoustics be like in the barn which is more used to the sound of blea ting lambs? “It’s a tin roof so it has been very tinny but we’ve had some good advice,” said Mrs Crone. 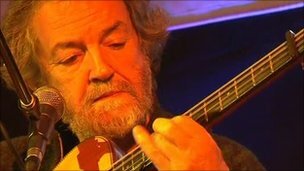 The venue is perfect for Andy Irvine as it is a short walk from his house. “Sitting on bales of hay it will be very rural and it’s just next door to me, so if I get tired I can go and have a lie down between songs,” he added. Several hundred people arrived for the gig and made themselves comfortable on the bales of hay. It was an intimate performance of songs from the new album and from Andy Irvine’s 45 year musical career. It may have been a bit cold, but the acoustics were excellent and, to Mrs Crone’s relief, there was no rain falling upon the tin roof. Hungary and Brittany between February 2009 and April 2010. Thanks to all my friends who helped me record it. let alone playing on every track bar one. I hope it won’t be my last album of the century! !